Hey, Nevadans, do you enjoy voting against your own interests? You do? Well, then have I got fantastic news for you! Your very own Attorney General, Adam Laxalt, is running for Governor this fall! So if you want to take a chance that online poker disappears in the gambling capital of the United States, go right on ahead and vote for him. You see, Adam Laxalt is staunchly against the existence of online poker. And he wants to be the top dog in a state that is funded by gambling. Well, let me correct something: he might not be staunchly against online poker, as that would imply that he is extremely committed to that point of view. He might be, but it is exceedingly obvious that he has taken up that stance because he is hanging on to the pocket of daddy Sheldon Adelson, the billionaire Republican political donor and CEO of the Las Vegas Sands Corp.
Adelson, as readers of this site likely know, believes that online poker threatens his brick-and-mortar gambling empire (it may actually, in fact, help it), though he contends that his aversion to online poker is because he wants to protect children and problem gamblers. He has made it his end-life goal to take online gambling in the United States with him to the grave. To this end, he and his legal team crafted the Restoration of America’s Wire Act (RAWA), which would effectively make online gambling illegal by literally making the official interpretation of the 1961 Wire Act an incorrect one. The Wire Act was designed more than half a century ago to curb organized crime by explicitly making sports betting over telecommunications lines illegal. When internet gambling became a thing, the Department of Justice not only extended the interpretation of the Wire Act to online sports betting (reasonable), but also to all internet gambling. In late 2011, the DoJ’s Office of Legal Counsel clarified the Wire Act in response to queries from a couple states, saying it only applied to sports betting. This angered Adelson and RAWA was born. Back to Laxalt, in both 2015 and 2016, he signed a letter from a handful of state Attorneys General supporting RAWA. It makes absolutely no sense that the AG of Nevada, a state fueled by gambling dollars, would want online poker to be banned in the U.S. It makes no sense except that Laxalt is closely tied to Adelson and wants to do right by daddy so he can keep receiving that sweet, sweet cheddar. Do with that what you will. He also name-dropped Steve Wynn and Nevada Senators Harry Reid and Dean Heller as supporters of RAWA, as if that matters. 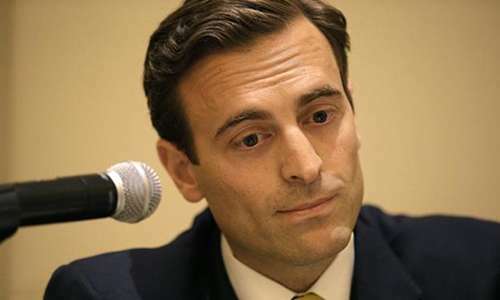 Sheldon Adelson was a major financial contributor to Laxalt’s campaign, but that is not the only reason Laxalt is beholden to the gambling kingpin. Adelson created the Coalition to Stop Internet Gambling (CSIG) with the help of lobbying firm j3 Strategies, a company which the Las Vegas Sands Corp. also uses for its lobbying efforts. Robert Uithoven, founder and president of j3, is on CSIG’s board. Alright, so Adelson used the same lobbying group that Sands does to setup CSIG. That doesn’t sound unusual. But who else works at j3 Strategies? Tessa Laxalt, sister of one Adam Laxalt. Oh, and if you also guessed that j3 coordinated Adam Laxalt’s 2014 AG campaign, you’d be right. Adam Laxalt is a stooge who has actively worked to ban online poker all because he wants to keep his fingers in Sheldon Adelson’s coin pouch. Now, I am not going to tell you to not vote for a person in the fall just because of online poker. Being a single-issue voter isn’t typically the wisest. I will say, though, that the reason Laxalt is an anti-online poker gubernatorial candidate shows him to be completely untrustworthy; who knows what other policy ideas he will have if the right person gives him the right amount of money? He has already sold his soul to the highest bidder, no honest person would vote for him, but crooks might?